A popular focus among many pastors in churches these days is the relevance of their "sermons" so that non-believers will understand the Scripture. The sermons are often exclusively positive, shallow in theology and doctrine and regularly omit the usage of biblical terms, again, for the sake of the non-believer to make them feel more comfortable to hear what is being said and not feel intimidated for not knowing the terms that are used. Should that be the focus of preaching by a pastor? Should the model they follow, regarding their preaching be modeled after those that are popular on television, or known to have large attendance at their churches? Too often though, what is being said is greatly watered-down and I might add, missing the power of the Holy Spirit behind it and within it, to really make an impact upon those that are hearing the pastor's sermon. Certain verses are isolated and used to make a point by the pastor, which often is not related to the context of the passage the verse is taken from. 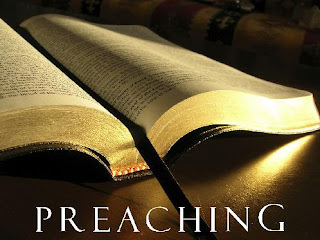 I firmly believe that as preaching is firmly grounded in a regular exposition of Scripture and lead by the Holy Spirit, people will be drawn to a church that preaches the Bible and delivers the whole counsel of God to the people (Acts 20:27), which will enable them to learn Bible more, discover God's will for their lives and also, to enable them fulfill the Great Commission too (Matthew 28:19-20). So, what should a pastor's preaching look like to both the believing Christian and the non-believer? Well, from Acts 20:20-21, we can learn about seven characteristics of the Apostle Paul's preaching, as a missionary and evangelist throughout Asia. This list is not my own, but it was taken from Matthew Henry's Commentary on Acts 20:17-35. (2.) He was a powerful preacher, which is intimated in his testifying to them; he preached as one upon oath, that was himself fully assured of the truth of what he preached and was desirous to convince them of it and to influence and govern them by it. He preached the gospel, not as a hawker proclaims news in the street (it is all one to him whether it be true or false), but as a conscientious witness gives in his evidence at the bar, with the utmost seriousness and concern. Paul preached the gospel as a testimony to them if they received it, but as a testimony against them if they rejected it. (3.) He was a profitable preacher, one that in all his preaching aimed at doing good to those he preached to; he studied that which was profitable unto them, which had a tendency to make them wise and good, wiser and better, to inform their judgments and reform their hearts and lives. He preached ta sumpheronta, such things as brought with them divine light, and heat, and power to their souls. It is not enough not to preach that which is hurtful, which leads into error or hardens in sin, but we must preach that which is profitable. We do all things, dearly beloved, for your edifying. Paul aimed to preach not that which was pleasing, but that which was profitable, and to please only in order to profit. God is said to teach his people to profit, Isaiah 48:17. Those teach for God that teach people to profit. (4.) He was a painstaking preacher, very industrious and indefatigable in his work; he preached publicly, and from house to house. He did not confine himself to a corner when he had opportunity of preaching in the great congregation; nor did he confine himself to the congregation when there was occasion for private and personal instruction. He was neither afraid nor ashamed to preach the gospel publicly, nor did he grudge to bestow his pains privately, among a few, when there was occasion for it. He preached publicly to the flock that came together into the green pastures, and went from house to house to seek those that were weak and had wandered, and did not think that the one would excuse him from the other. Ministers should in their private visits, and as they go from house to house, discourse of those things which they have taught publicly, repeat them, inculcate them, and explain them, if it be needful, asking, Have you understood all these things? And, especially, they should help persons to apply the truth to themselves and their own case. (5.) He was a faithful preacher. He not only preached that which was profitable, but he preached every thing that he thought might be profitable, and kept back nothing, though the preaching of it might either cost him more pains or be disobliging to some and expose him to their ill-will. He declined not preaching whatever he thought might be profitable, though it was not fashionable, nor to some acceptable. He did not keep back reproofs, when they were necessary and would be profitable, for fear of offending; nor did he keep back the preaching of the cross, though he knew it was to the Jews a stumbling-block and to the Greeks foolishness, as the Roman missionaries in China lately did. (6.) He was a catholic preacher. He testified both to the Jews and also to the Greeks. Though he was born and bred a Jew, and had an entire affection for that nation, and was trained up in their prejudices against the Gentiles, yet he did not therefore confine himself to the Jews and avoid the Gentiles; but preached as readily to them as to the Jews, and conversed as freely with them. And, on the other hand, though he was called to be the apostle of the Gentiles, and the Jews had an implacable enmity against him upon that score, had done him many an ill turn, and here at Ephesus were continually plotting against him, yet he did not therefore abandon them as reprobates, but continued to deal with them for their good. Ministers must preach the gospel with impartiality; for they are ministers of Christ for the universal* church. *The use of the word catholic here does not represent the Catholic church, but means universal, Paul's preaching was universal and was not exclusive toward anyone. (7.) He was a truly Christian evangelical preacher. He did not preach philosophical notions, or matters of doubtful disputation, nor did he preach politics, or intermeddle at all with affairs of state or the civil government; but he preached faith and repentance, the two great gospel graces, the nature and necessity of them; these he urged upon all occasions. Bold italics added are mine. I wonder how many more people in the church, will begin to listen a little more closely to the pastor's sermon this Sunday, to see if what they are hearing reflects most if not all of the seven characteristics noted above. It is my sincere hope and prayer that people who are searching for a church to call home, that they may hear these things from the pastor this Sunday and any time the pastor steps up to preach, to glorify God and edify and equip the saints for ministry. These preaching characteristics need to be more notable by those that aspire to preach in today's post-modern world and as some would say, in this post-Christian society too. Without a powerful demonstration of these characteristics, whatever is spoken by one claiming to be preaching, will not glorify God at all. Would you agree or disagree and why?